The Return of Shakuni on Television! Epic Mahabharata would not have been so intriguing without the character of Shakuni and the MAN who breathed life into Shakuni on small screen was none other than Mr. Gufi Paintal. He is the only Actor who got the priviledge of playing Shakuni once again after a decade in Imagine TV’s new show Dwaarkadeesh. Rangmunch.TV brings to you an exclusive interview of Gufi Paintal who talked about Shakuni Mama as a character and his journey in the Entertainment Industry. Rangmunch.TV: You have played the character of Shakuni for the longest period of time, first in ‘Mahabharat’ and now in ‘Dwarakadheesh’ in Imagine TV. How would you explain the psyche of Shakuni? Gufi Paintal:Shakuni’s psyche was simple. He thought that the marriage of his sister was unlawful and very much one sided. He was very upset with why his sister was not getting her rightful place in Dhritarashtra’s life. That’s the time he took an oath to destroy the kingdom and all the princes associated with it. He may have been a pure hearted guy before all this but seeing his sister’s condition, he became a person filled with poison and wanted to avenge the wrong doing . Rangmunch.TV: So Shakuni was a man of vision who saw to it that all his intentions came through? Gufi Paintal: Yes, because he was a very shrewd politician of his kind. On the fundamental side was Shakuni and on the positive side was Krishna. The fight was between these two politicians. Rangmunch.TV: Why did you choose to come back on the small screen with a mythological show considering there is so much variety now? Gufi Paintal: Well, I have played several fictional characters too, but people’s perception of Shakuni has not changed over the years. My counterparts never got this role because of certain image the character has maintained. You can’t get Arjun, Ram or Krishna of those times to play their roles again, because of the youth factor. But Shakuni is one who has stayed the same from the period of Mahabharat days. So when I was offered the character that is so close to my heart and has given me so much name and fame, I instantly agreed. Rangmunch.TV: Has there been any improvisation to the character this time around ? Gufi Paintal: No, you cannot change something that is part of Indian Mythology. You also cannot change the character drastically too. You can improve but cannot prove it. You cannot go away from the character. One may have tried to in past but it falls flat. Rangmunch.TV: How easier was it to play this character so convincingly for the second time? Gufi Paintal: Basically I have been constantly in touch with this character for the last 20 years. Whereever I go, I am called Shakuni Mama. You get recognized for such a pivotal character. Rather in the year 1993, I was also slated the best actor among 13 others in the world in Cannes festival. I always feel proud of the fact that my job was appreciated. Rangmunch.TV: How do you deal with the situation where you are not too convinced about a scene given to you? Gufi Paintal: Ideally I would discuss and would try to convince the director. I would say that the scene should be done this way, and the director would understand, as I have done the bit before. People respect my vision, my outlook. In spite of the generation gap there is immense understanding. Rangmunch.TV: In today’s world where villains and vamps are practically there in every show, what role does a Shakuni play in today’s time? Gufi Paintal: Let me tell you something. Amjad khan became hugely popular after his role as Gabbar Singh in Sholay. There after he went on to do 100 movies. When he died, the news said “Gabbar Singh died”. Similarly Shakuni is such a character where he will be remembered all the time. So if papers one day come out and say Shakuni died, its going to be a privelege to be in that zone. Rangmunch.TV: Shakuni has always been driven by a motive. Today’s vamps and villains are just becoming a negative character for flimsy reasons. What according to you is the impact of Shakuni in ‘Dwarkadheesh’? Gufi Paintal: The story has lot of shades for Shakuni to exhibit. Its definitely on a larger scale this time. So, it is a new experience for me too this time around. Rangmunch.TV: You have also been associated with direction. What do you think has changed over the last few years with so many different kinds of shows on Television now ? Gufi Paintal: The story telling has deeply changed from then to now. Back then, we used get enough time to relate to the character and it used to take 4 days to shoot an episode. But that is not the case now. People take less time and are moving fast to depict something. They should take more time especially when it concerns an epic. Rangmunch.TV: If given a choice, would you prefer to make a movie or a Television show and why ? Gufi Paintal: I have directed a lot of Television shows and cinema being the mother of all. I would love to direct a movie. In one go, you shoot from start to finish as you are totally involved in the subject aur ek do mahine mein aap ko result dikh jaata hai..So, if given an option, I would want to direct a movie. Rangmunch.TV: Why is that people still don’t give Television the due place it deserves? Technically things have improved but still there is that doubt in peoples mind. Do you agree? Gufi Paintal: No, I don’t think so. Television is become a multicrore business and maybe bigger than film industry too. The very fact that big stars like Shah rukh Khan, Amitabh Bachchan, and Salman Khan have stepped into the Television world says it all. Small screen has its own parameters and has got its respectful place. Rangmunch.TV: What advice would you give the new aspiring actors who want to enter this industry? Gufi Paintal: I would say more than your talent or hard work, its your destiny that makes way for you here. Its one’s fate that brings you here. I was also talented but it took me quite a while to get where I am and get variety of roles. So the timing has to be right too. Hard work, talent, personality are all fine but it’s your destiny that plays a strong role here. Rangmunch.TV: One message for your fans? Gufi Paintal: I want to thank all my fans for all the love and support they have given me. I want them to continue giving me the respect they have always given and I would like to leave this world in my shoes. Inspite of playing the negative character, I have always been given immense respect. Its like they love to hate me, (laughs). I have done various sympathetic and emotional roles too and people have been watching me and appreciating it. I just want to do my job sincerely. 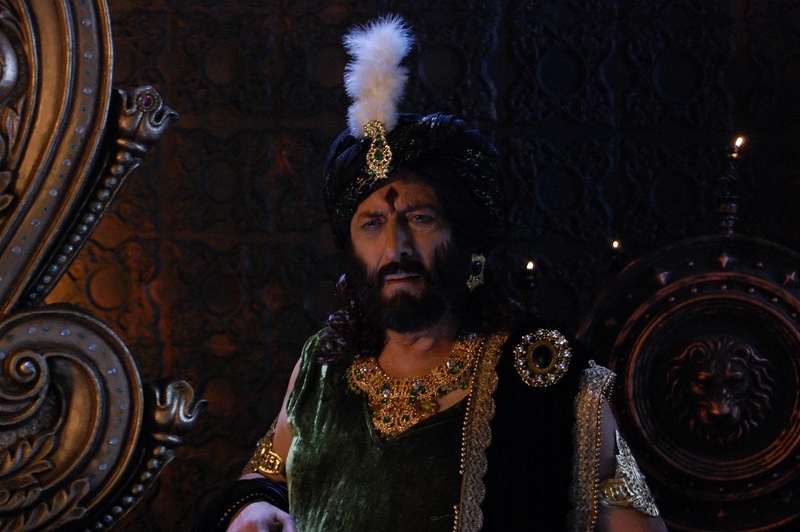 Rangmunch.TV would like to thank Mr. Paintal for giving us his time and an insight into the character of Shakuni.